Hippocrates, Paracelsus and Galen, prominent physicians of ancient times, considered it panacea (a cure-all) for a plethora of ailments. When the petals St. John’s Wort Oil are infused into extra virgin organic olive oil and placed directly under the sun light, they produce an oil of high purity which gives off its maximum benefits. In DIMITRA St. John’s Wort Oil with organic ingredients you will discover a purely natural therapy for all skin conditions, like acne, dry skin, herpes, psoriasis etc. Its anti-inflammatory and antiseptic action contribute greatly to the treatment of muscle injuries, tendons, cramps, frozen shoulder, inflammations, swellings and wound healing. It should also be noted that during ancient times it was potable to soothe ulcers, stop diarrhea, reduce phlegms, relieve menstrual pain and treat anxiety disorders. It also serves as an excellent haemostatic agent. Ideal for pets and the treatment of wounds as well as anti parasitic by applying a small amount on the skin. 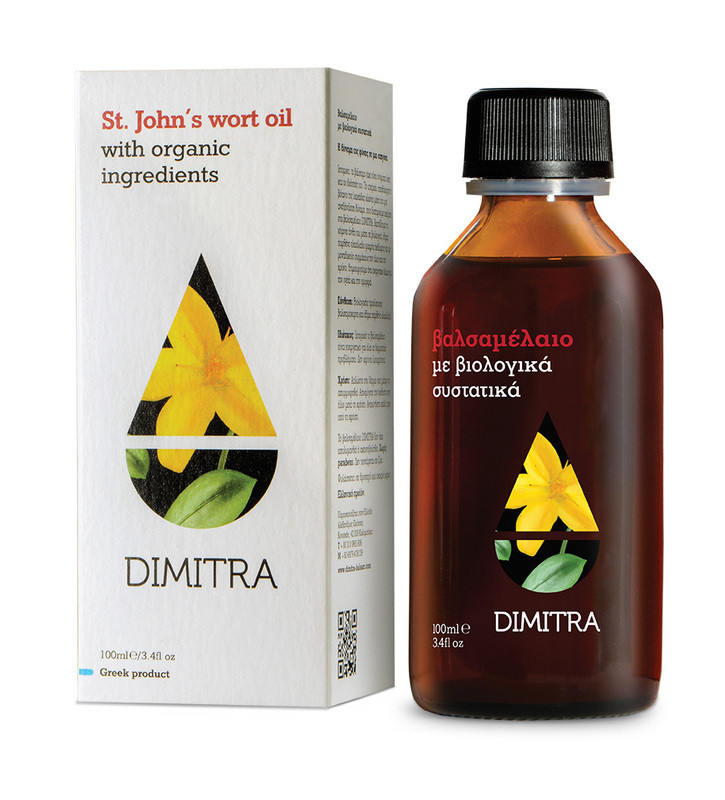 DIMITRA St. John’s Wort Oil with organic ingredients is a mild oil easily applied, leaving no grease, with pleasant smell that helps relaxing during massage time. All our products are 100% natural compositions of certified organic extracts, herbal oils and bee products. They are paraben free. There is no disinfectants use or radiation and it is not tested on animals.